LOS ANGELES, CA--(Marketwire - January 28, 2011) - R.E.M. have announced that they will premiere the video for their new single, "Mine Smell Like Honey," on AOL Music on January 31st. The track is taken from the band's upcoming album Collapse Into Now, due out March 8th, 2011, on Warner Bros. Records. The video was directed by Dominic DeJoseph, who has directed music videos for R.E.M, including "Bittersweet Me," and "New Test Leper" (co-directed with Lance Bangs) from New Adventures In Hi-Fi, tour films for Monster, as well as music videos for Jenny Lewis, Tilly and The Wall, The Stills, Ryan Adams, The Dandy Warhols, and Natalie Merchant. He also directed the documentaries Johnny Berlin (Executive Producer, Michael Stipe), The Heart of America (with Bono), and The One Dollar Diary (with Wim Wenders). 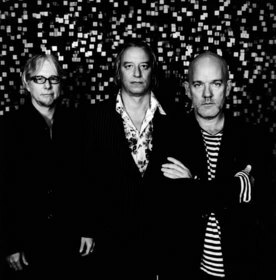 For Collapse Into Now, R.E.M., which is singer Michael Stipe, guitarist Peter Buck, and bassist Mike Mills, re-teamed with Grammy Award-winning producer Jacknife Lee, who produced the band's acclaimed previous album Accelerate. R.E.M. and Lee recorded the album in New Orleans at the Music Shed and in Berlin at the famed Hansa Studios, where several legendary albums, including David Bowie's Heroes, U2's Achtung Baby, and Iggy Pop's Lust for Life, were made. Additional recording and mixing was done at the venerable Blackbird Studio in Nashville.